If you’re new to the art and looking for some helpful photography tips, here’s where to start off. Learning all of the essentials to pack in your camera bag is a must. The last thing you need when starting out is to be missing a crucial tool while on a shoot. We’ve created this helpful infographic to help point you in the right direction while packing up your photography gear. From extra lenses, to garbage bags, to business cards — we’ve got it all covered. Good luck! We love this nifty infographic that includes tons of tips on how to create a happy home. Over 1,000 people were asked how home décor decisions can impact their moods. A whopping 93% felt that a room’s décor could have a negative or positive effect on their state of mind. Here are six happy home resolutions that show you how to make small changes to your home that can help boost your mood. Our tip? Create some photo canvas prints using your favorite images! That extra touch of personalization can help improve any space. The power of color when it comes to any kind of design is truly amazing. Each person associates certain colors with different things. It has the power to evoke specific emotions, moods, and even feelings. With that being said, color has a proven ability to subconsciously affect us when it comes to marketing, design, home décor, and more. A savvy company or designer knows this and chooses colors to represent their brands or office spaces very carefully. You know us, we love a good infographic! Especially one that includes some helpful photography tips. We recently found this fabulous infographic with some information on how to take amazing photos with your phone. It includes some nifty preparation, composition, and filter suggestions that are pretty easy to get the hang of. Are there any additional tips that this infographic may have missed? Share with us in the comments! We can help you print photos from your phone, no matter the resolution! Simply check out our photo to canvas prints. 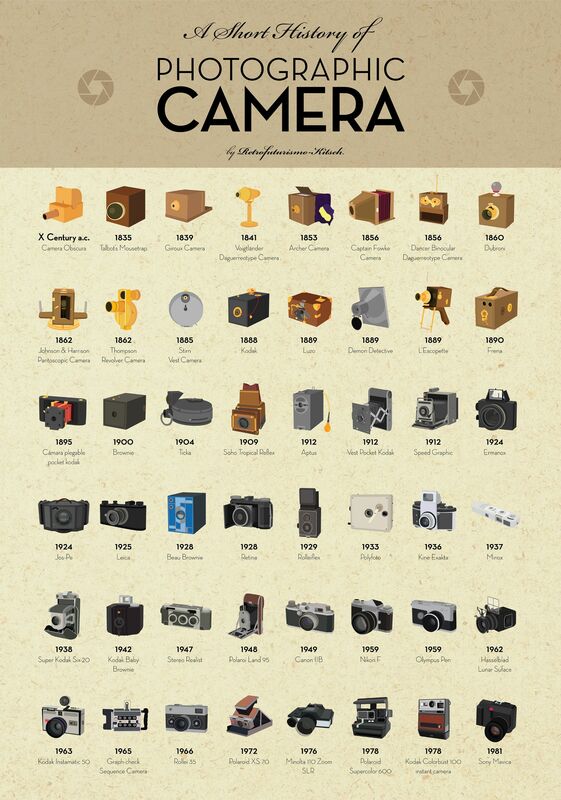 The perfect infographic for a photography enthusiast, this poster gives you a visual history of photographic cameras. Some iconic, and some a bit more unusual — the poster illustrates camera models beginning with the basic camera obscura, and ending with the Sony Mavica. To get a better view of the infographic, click here to see a full-sized version. The artist has been kind enough to provide a download of the original version so that you can print it out for yourself. Perhaps you can even turn it into a nifty canvas print! At CanvasPop we’re not just passionate about creating unique photo to canvas prints. We’re also huge photography buffs! Many of our own employees are talented photographers themselves. If you’re looking at getting into photography as well, we suggest you start by checking out this awesome infographic by Focus Camera. It contains tons of great photography tips and tricks from those of you who are just starting out.